Picked by Apple as a featured App for Busy Moms, Baby Connect is the #1 and the most comprehensive baby tracking application on the AppStore. It has graphical reports and trending charts, weekly averages, medicine, vaccine and growth tracking, timers, notifications, reminder alarms, emails, .csv export, an easy to use interface and unlimited data. 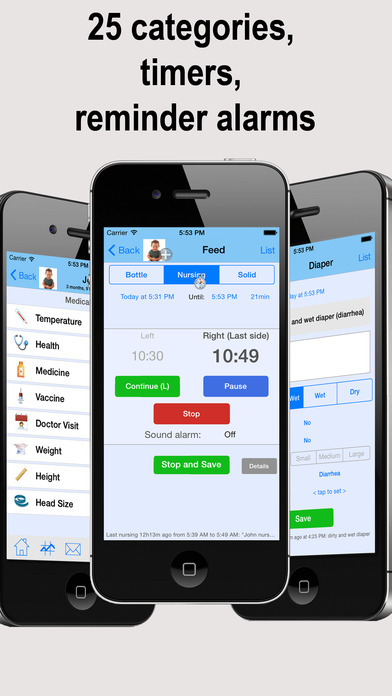 Baby Connect will synchronize information with your spouse, babysitter, nanny or daycare wherever they are. If you change or lose your phone, no information is lost, you can always connect to your account with a browser or with another phone. 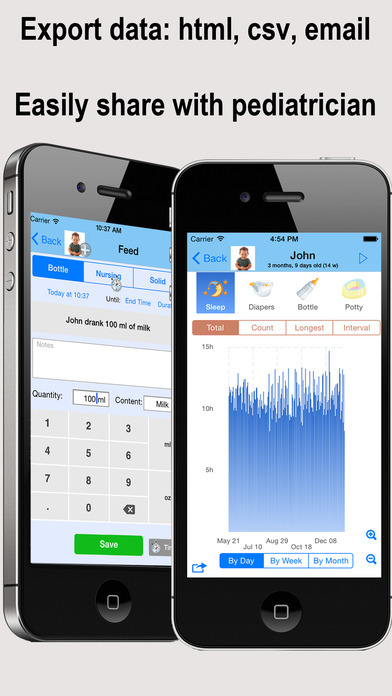 You can record not only feedings, nursing, naps, diapers, milestones, pumping, but also the baby’s mood, temperature, what kind of game he’s playing, his gps location, and attach pictures. A web interface is also accessible for free, so your nanny doesn't need an iPhone to view and enter information about your baby. You can compare with previous day and previous week averages, and view the data on graphs to identify trends. You can view when was the last medicine or vaccine. You can also track weight, height, and head size, compare with the US or International percentiles and display the growth chart. With Baby Connect, you have access to the updates from the caregiver while you're away. 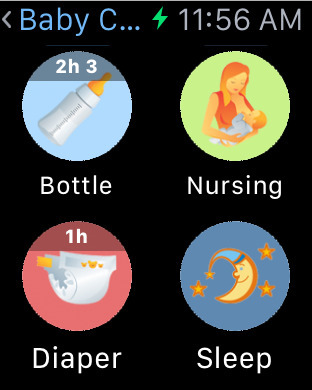 You can also setup notifications to be immediately informed when something happens, and set a reminder alarm and be notified when it's time for the next feeding, diaper change, medicine, ... Your baby will receive much better care thanks to all the detailed information automatically transmitted to each family member, and to the nanny. * Track doctor visits, medicines, vaccines, sickness, weight, height, head size. * Display growth charts with percentile comparison. * For Preemies, percentiles are calculated with the birth date or with the due date. * Display all entries on a graphical Timeline view. 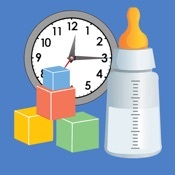 * Timer to track naps, activities, feeding session, mood and nursing duration. The last nursing side is indicated as a reminder. * Email formatted reports, graphs and Excel-compatible .csv files to spouses, doctors and nannies/sitters. * The application has been designed for maximum security. Everything is password protected. The app contains optional subscription plans for daycares. It is only for professional child care centers, not for parents and families. It gives additional features to our web application. Plans are $8.99, $44.99 or $89.99 per month and are automatically renewed each month. The first month is free, subscriptions can be cancelled at any time.